Lensbaby’s creative lens line now includes the Lensbaby Twist 60. Modeled on the 19th century Petzval lens, the new Lensbaby Twist 60 provides the subject-to-background separation of the iconic optics designed by Joseph Petzval in 1840. 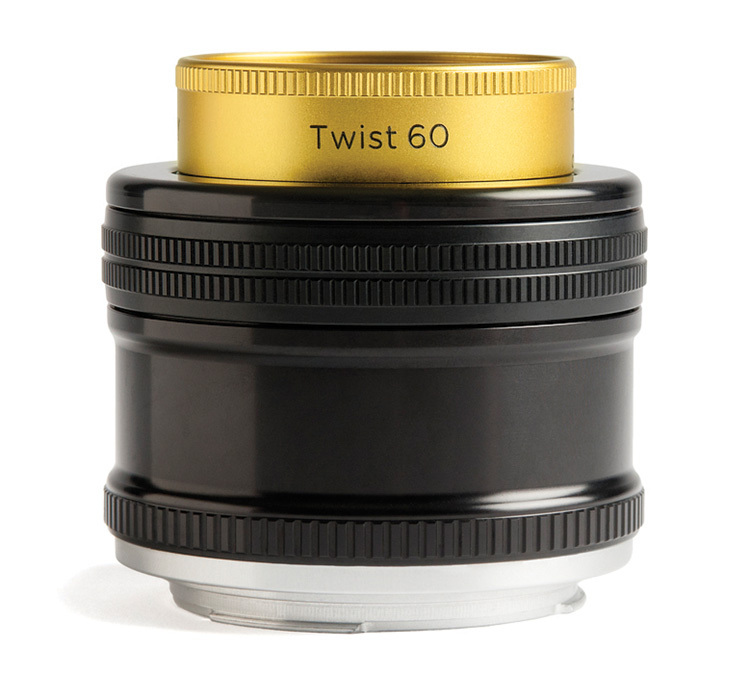 With its swirling blur and enhanced vignetting, the Twist 60 is ideal for portraits and other creative applications. Designed for use on full-frame cameras, the metal-bodied Twist 60 offers a 60mm focal length and a 12 blade, f/2.5-22 aperture for ultimate control over the amount of background swirl. The lens is available in Canon EF, Nikon F and Sony E mounts or separately for use with Lensbaby’s Optic Swap System-compatible lenses will ship in May and is now available for pre-order. Price: $280; $180 (Optic Swap System model). Contact: Lensbaby, lensbaby.com. These carbon fiber tripods (with either 100mm or 75mm platforms) may be short and stout with a maximum height of 11 inches but they’re tough and capable of holding up to 220 or 165 pounds, respectively. Perfect for low angle shooting, including those finicky macro photos, both models can be set to a minimum height of 3.2 inches, with each leg independently positioned. The tripods come with sets of rubber feet, a flat plate with removable weight hook and a custom carry case. List Price: $399 (100mm); $349 (75mm). Contact: Induro, indurogear.com. The latest travel jibs from Benro are available in three additional sizes including the MoveUp 8, MoveUp 15 and the MoveUp 20, which support up to 17.6, 33, and 44 pounds, respectively. Designed for creating smooth video footage, these versatile jibs include a 75mm Bowl Mount for the MoveUp 8 and a 100mm Bowl Mount for the two larger models. In addition to a telescoping leveling arm, telescoping tail, the jibs are bundled with several accessories including a weight bar and rolling case. List Price: starting at $749. Contact: Benro, benrousa.com. The latest graphics monitors from Eizo, the ColorEdge CG2420 and CS2420, have been designed to provide a broader viewing screen thanks to bezels that are 39 percent smaller than their predecessors. A flat design incorporates electrostatic switches for changing monitor settings and a built-in handle makes it easy to transport these 24-inch monitors. The CG2420 features an integrated self-calibration sensor, while the CS2420 comes in two models, one with the EIZO EX3 colorimeter package. List Price: $1,599 (CG2420); $964 (CS2420 w/colorimeter); $869. Contact: Eizo, eizo.com. The Godzilla of storage, the G-Rack 12, is a scalable NAS (network attached storage) solution that can handle even the most demanding content needs in both capacity and speed. This 12-bay server is configurable for up to 120TB of storage, with an option to add an Expansion Chassis with up to an additional 120TB of space. The 12-bay, expandable units incorporate enterprise hard drives and are available in 48TB, 72TB, 96TB and 120TB storage capacities and are designed to handle 4K files and beyond. List Price: TBD, depends on configuration. Contact: G-Technology, g-technology.com. Need more storage for your Mac? Look no further. OWC recently announced PCIe-based flash storage upgrade kits for mid-2013-and-later MacBook Pro with retina display and MacBook Air. The kits, available in 480GB and 1TB capacities, come with all the tools you need to install the new SSD but come with an enclosure so you can re-purpose the Mac’s original flash drive as an external storage device. OWC has free videos and customer support to help you throughout the process. List Price: $445/$720 (with kit); $380/$650 (without kit). Contact: OWC, owcdigital.com. A free update for current users, the latest iteration of this sophisticated pro imaging software offers a number of improvements over its predecessor, including a new Skin Tone Uniformity Tool for adjusting saturation and lightness. You’ll also find several new workflow options such as rotatable live view as well as additional shortcuts and sequence tool management for the XF Camera System (with Feature Update #2). And, for more efficient asset management, version 9.1 offers the ability to control and limit keyword libraries via export/output keyword restrictions. List Price: $299 ($99 update for Capture One Pro 7 or 8 owners). Contact: Phase One, phaseone.com. Pelican cases are the go-to transports for professionals but often mean a compromise between weight and protection. Good news—the new Pelican Air cases have shed some weight and are up to 40% lighter than their predecessors. At the same time, these hard-sided cases maintain the same durability as before. Constructed of lightweight HPX2 resin, the Air models are available in six different sizes including the wheeled carry-on 1535 and the wheeled check-in 1615. Look for more than 20 new sizes over the next 18 months. List Price: from $135. Contact: Pelican, pelican.com. Leave no gear behind with the Think Tank Photo Production Manager 50. This monster of a rolling bag, which measures 17 x 53.1 x 12.6 inches, can accommodate pretty much everything you need for a shoot from lighting gear, modifiers, lightstands, tripods and all those cables, extension cords and small accessories necessary to get the job done. As always, Think Tank Photo pays attention to details and has designed this roller for one-person or two-person transport. List Price: $600. Contact: Think Tank Photo, thinktankphoto.com.